It’s not just your imagination. There’s a lot more hate and intolerance these days. Whether it’s hate crimes against Muslims, a white supremacist gunning down black churchgoers or Leah Remini venting her Disney-sponsored ire at her former church on A&E (which leads to acts of violence against local churches), people are becoming desensitized to hate and bigotry, fueling yet more sensationalized hate-slanted media. It’s a downward spiral rapidly spinning out of control. The problem may seem insurmountable. And, it would be easy to throw up our hands and say nothing can be done about it—that everyone is too far removed from it or there really is no solution. But there is a solution, a simple one, espoused by nearly every religion on Earth. It’s called The Golden Rule. Christianity: “And as ye would that men should do to you, do ye also to them likewise.” Luke 6:31, King James Version. All citations are from religioustolerance.org. The Golden Rule is spread not just among religions, but also among great philosophers throughout the ages. Tolerance is the bedrock that keeps civilized people from descending into barbarism. War, violence, hatred and bigotry are all violations of the Golden Rule. So how do we solve the problem of the desensitization of hate and intolerance? The short answer is to follow the Golden Rule and refuse to be swayed by the politics of hate. Of course, that can be easier said than done, because we are increasingly bombarded with polarizing messages that isolate us more and more. So much so that it can feel like everyone outside your immediate circle is a stranger to be distrusted… and disliked. Tolerance takes practice, and you start right in your own neighborhood. I live out in the country and make it a practice to wave at everyone who passes by in their car when I’m out walking the dog. But rather than focusing on what we don’t like about others, we should look for ways to accept—even admire—our differences. I may not agree with your political viewpoint, but I respect your right to your own opinion. You may not agree with my religion, but you respect my right to practice as I choose. A Christian mother may admire the calmness and perseverance of a Buddhist monk. The Buddhist for his part may admire the passion and energy that the Christian mom pours into the raising of her children. We start with that basic respect for each other and a belief that there is something good in each of us. We treat others the way we would like to be treated ourselves. Tolerance takes practice, and you start right in your own neighborhood. I live out in the country and make it a practice to wave at everyone who passes by in their car when I’m out walking the dog. Believe me, they wave back. Try smiling at the Sikh bus driver or the crossing guard with the hijab and see if that doesn’t start a little chain reaction. From there, it’s an easy step to demanding tolerance for all. It isn’t just a case of being polite and friendly, but also calling out injustice and unfairness and demanding change. Write to that magazine and tell them to stop printing hate speech and publish some good news instead. Stand up for someone you know who is being bullied for being different. 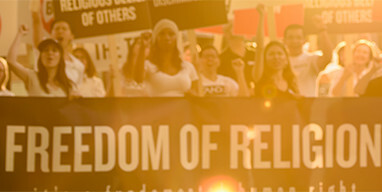 Take part in a human rights rally. Support an interfaith youth group. Get involved. In other words, you and I should agree to follow our respective golden rules. And if we did that and made a concerted effort to get others to do the same, it would go a long way toward turning the tide on hate and intolerance.